Steel Verandahs provide an entertaining area to those who want a longer lasting heavy duty structure. Verandahs themselves can offer other features besides the entertaining area aspect. They can protect the house from the sun, the wind & the rain. In regards to the wind we can build vertical timber decking as a shield or we can install patio blinds. This can give you a better living experience inside your home staying warmer in winter and cooler in summer. As it gives your home an additional layer of protection. 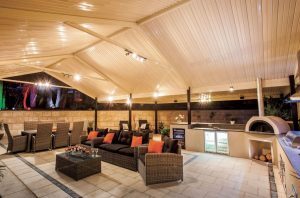 Verandahs give you the ability to entertain guests all year round. This can be topped of with blinds to close of the area from the wind, rain and sun. For those who choose a Steel Verandah over a Timber Verandah do so because of several reasons. Can last forever if properly maintained. We can make it look ultra-modern, and add that extra value to your home. We can have someone out there within 24 hours to give you a free quote and any additional helpful advice.